When we refer to periodontal (gum) disease, we’re actually talking about a family of progressive, infectious diseases that attack the gums and other tissues attached to the teeth. Caused primarily by bacterial plaque left on tooth surfaces from inefficient oral hygiene, gum disease can ultimately lead to tooth loss. There’s only one way to stop the infection and restore health to diseased tissues — remove all of the offending plaque and calculus (hardened plaque deposits) possible from tooth and gum surfaces, including below the gum line at the roots. The basic tools for this task are specialized hand instruments called scalers or ultrasonic equipment that vibrates plaque loose. A series of cleaning sessions using these tools could stop the infection and promote healing if followed with a consistent, efficient daily hygiene habit. There are times, however, when the infection has progressed so deeply below the gum line or into the tissues that it requires other procedures to remove the plaque and infected tissue. One such situation is the formation of an abscess within the gum tissues, a pus-filled sac that has developed in response to infection. After administering local anesthesia, the abscess must be treated to remove the cause and allow the infectious fluid to drain. The area is then thoroughly flushed with saline or an antibacterial solution. The gum tissues are not completely attached to the tooth surface for a small distance creating a space. 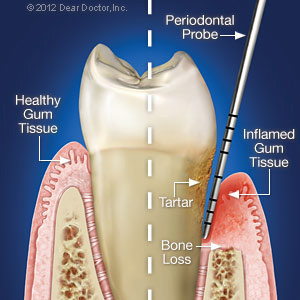 These spaces are called periodontal pockets when they are inflamed and continue to deepen as the disease progresses. These inflamed and sometimes pus-filled pockets form when tissues damaged by the infection detach from the teeth. If the pockets are located near the gum line, it may be possible to clean out the infectious material using scaling techniques. If, however, they’re located four or more millimeters below the gum line a technique known as root planing may be needed, where plaque and calculus are shaved or “planed” from the root surface. As the disease progresses and the pockets deepen, it may also be necessary for surgical intervention to gain access to the tooth roots. To stop gum disease and promote soft tissue healing, we should use any or all treatment tools at our disposal to reach even the most difficult places for removing plaque and calculus. The end result — a saved tooth — is well worth the effort.